The first high-level meeting since the Russian and U.S. presidents held talks in Helsinki in July took place in Geneva. 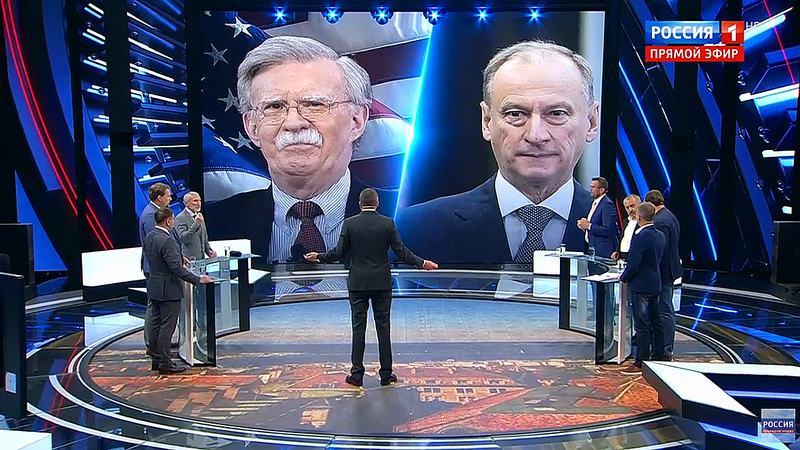 John Bolton, the U.S. national security adviser, and his Russian counterpart, Nikolai Patrushev, met behind closed doors in a one-to-one session that lasted two hours. 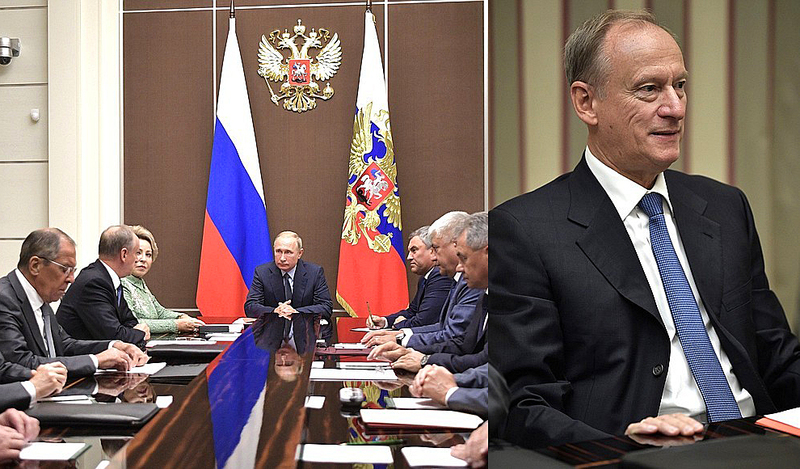 In preparation for the meeting, the Russian state media highlighted the fact that Russian President Putin personally prepped Patrushev for the talks during a security council meeting in Russia earlier this week. Patrushev is a Kremlin hawk, who spent 10 years heading the FSB, the domestic successor agency to the KGB. He is Putin’s close associate, with the conspiratorial world view and extensive espionage experience. 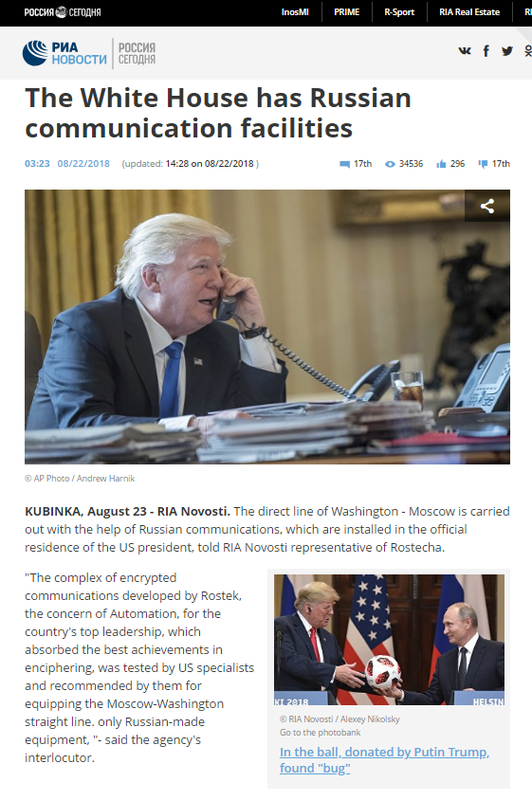 Apropos of nothing, the Russian state media released news articles, reporting that President Trump’s residence at the White House has a direct hotline to Moscow, utilizing exclusively Russian-made encryption equipment. Multiple articles were simultaneously released in Russian and English. Russia’s state media outlet Sputnik entitled its article in the most conspiratorial vein possible: “White House Uses Russian Tech to Keep in Touch With Kremlin.” The Embassy of Russia in the U.S. amplified the same story on Twitter, perhaps to ensure that it doesn’t go unnoticed by their American counterparts. 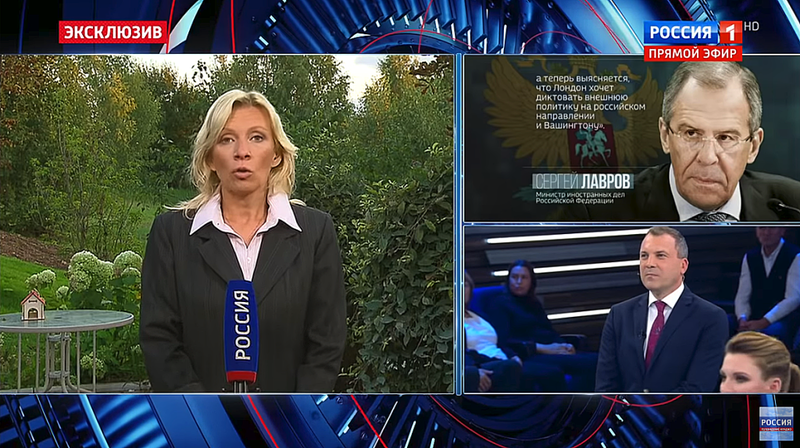 The Russian state media made emphasis at the terminal located “at the President’s residence,” but in fact there are three known terminals: in the Pentagon, the White House and at the Pentagon’s backup site, located in the Raven Rock Mountain. According to a directive of September 1985, signed by President Ronald Reagan, the President could at any time appoint new locations for additional Hotline terminals. The location of any additional terminals would be classified as “Secret.” Whether or not this has happened is currently unknown. Hotline messages may only be released with explicit approval of the president, and even releasing information as to whether this link has been used is a presidential prerogative. The system is traditionally used to communicate in moments of crisis, such as the September 11, 2001 terror attacks or the U.S. invasion of Iraq. The system evolved from teletype more than 50 years ago, to facsimile and eventually to email that links the U.S. and Russia through their Nuclear Risk Reduction Centers. Since the 1990s, direct voice conversations have been made possible, using the so-called Direct Voice Link (DVL). It has terminals at both ends near the offices of the Presidents and is routed (multiplexed) over the same satellite links as the secure e-mail Direct Communication Link (DCL). In 2008, the previous hotline agreements were consolidated into a single “Secure Communications System Agreement,” signed by Russia and the U.S. The fiber optic-enabled system became operational on January 1, 2008, including software for both talking and sending email messages. In 2013, the Obama administration added a channel intended to send email messages and attachments about cyber incidents. Former President Barack Obama used the system only once, to address Russia’s interference in the presidential campaign. Obama used the hotline in 2016 to warn Putin of grave consequences if Russian interference didn’t stop. 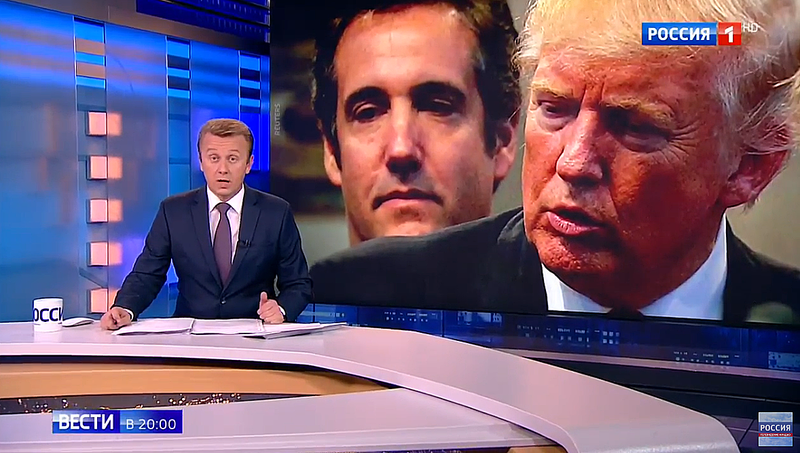 Russian state media claimed that “Russian-made equipment has been used exclusively ever since the hotline came about” for the direct telephone link connecting Washington with Moscow. Putin previously noted that he talks to Trump over the telephone on a regular basis. The timing of this seemingly irrelevant announcement is thought-provoking, as Moscow is growing impatient with Trump. While the Kremlin was more than pleased with the Helsinki meeting between the two world leaders, U.S.-Russia relations continue to be strained. New sanctions and the threat of imposing additional “economic pain” upon the Kremlin sent the ruble tumbling. The price of vodka in Russia just went up and the mood in the Kremlin seems to be in a downward spiral. Kremlin spokesman Dmitry Peskov said, “We of course welcome statements that affirm a readiness to cooperate, but we would welcome even more some kind of concrete actions.” Deputy Foreign Minister of Russia Sergei Ryabkov said that Russia will “get rid of the dollar” and threatened the U.S. with unspecified retaliatory measures. 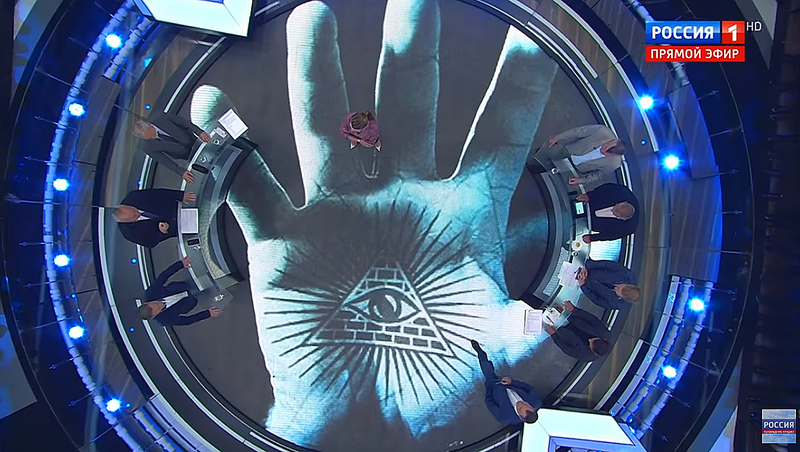 In anticipation of the additional economic turmoil, the Russian state TV is actively propagating the idea that Russia is a victim of a global conspiracy. According to the latest poll, 66% of the Russians believe in this theory. 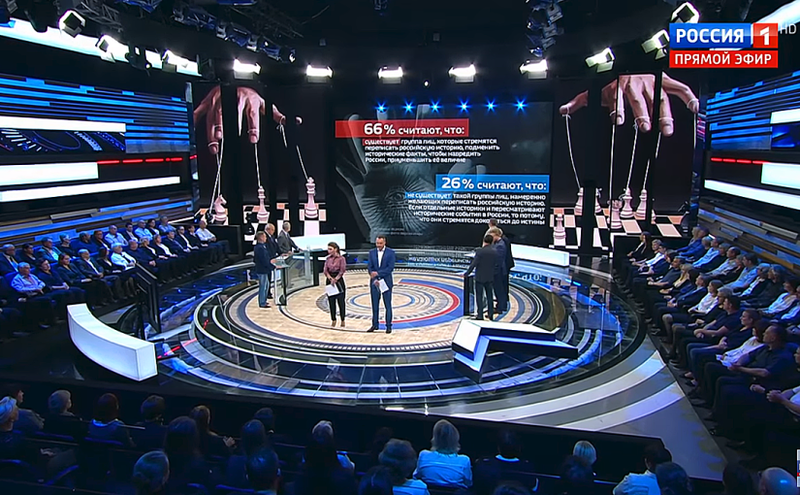 The host of a state TV talk show “60 Minutes” Olga Skabeeva said: “When we look at Washington, we understand that the sanctions mean there truly is a conspiracy.” Maria Zakharova, the spokeswoman for the Russian Foreign Ministry, criticized the panelist who refused to believe the idea of a global conspiracy against Russia. Zakharova said, “It’s not a matter of a belief… it’s a matter of knowing… You don’t have to believe or disbelieve. You have to be capable of analyzing, listening and reaching appropriate conclusions.” Franz Klintsevich, a member of the Defense Committee of Russia’s upper house of parliament, explicitly endorsed the theory of a “multi-faceted global plot to destroy Russia,” going back for centuries. The Russians are growing increasingly concerned that Trump might be impeached if the Democrats gain the majority in the midterms, especially in light of recent developments. The news articles about “the secret line” between the Kremlin and the White House might carry an implied threat to leak the content of communications between Trump and Putin, unless concrete measures to derail the sanctions are taken by the Trump administration. Russian President Vladimir Putin previously asserted that he speaks to Trump via the telephone on a regular basis. However, readouts distributed by the White House reflect only 8 calls between Trump and Putin. This suggests the possibility that another secure line is indeed being used for the ongoing communications. A Trump administration official told CNN’s Jeremy Diamond that the White House puts out readouts for every call Trump has with Putin, knowing that it “would’ve been a disaster if news leaked of a secret call.” The Russian state media may be threatening Trump with the possibility of such a disclosure, while also reminding him that the Kremlin is purportedly in control over the technology in question and seemingly, over the Trump-Putin relationship as a whole.